In a medium pot, combine the syrup, molasses, salt and spices. Heat to a light boil over medium heat, stirring occasionally. Remove the pot from the heat, and stir in the baking soda and oil until it�? ?s thoroughly combined. Add 2 1/2 cups of the flour, and fold it in gently to the molasses mixture.On a floured surface, knead the dough until thoroughly blended, adding additional flour as necessary until you get a solid but soft dough. Divide the dough in half, wrap one piece in plastic wrap and set aside. You can chill the dough before rolling, but it�? ?s not absolutely necessary.Preheat oven to 325F. With floured rolling pin, roll the dough out to slightly less than �?¼ inch thick. With floured cookie cutters or a knife, cut dough into shapes (or according to dimensions for a house). Reserve trimmings and reroll. Place cookies, spaced slightly apart since they will spread a little, on cookie sheets. If you plan to hang cookies as decorations, make a hole in the top at this point. 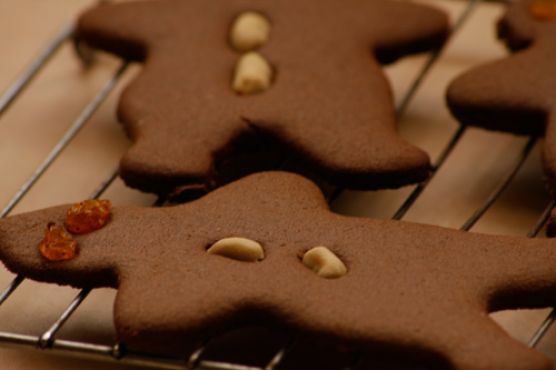 Decorate the cookies with nuts and/or dried fruit, pressing them into the dough so that they�? ?ll stick. Bake until brown around edges, about 12 min. Makes 30-40, depending on size of cookie cutters you use. Gingerbread Cookies works really well with Cream Sherry, Moscato d'Asti, and Port. Sweet bubbly Prosecco doesn't overwhelm simple sugar or shortbread cookies, a sweet cream sherry complements spiced cookies, and madeira's nutty notes match cookies with nuts perfectly.